In a large bowl, whisk together flour, salt, baking powder, and cinnamon until throughly combined. In a separate bowl, whisk the eggs, milk, oil, honey, and vanilla together. Mix well! Pour the wet ingredients into the bowl with the dry ingredients. Whisk only until large lumps disappear. The batter should be a bit thick. Heat the waffle maker and spray it with non fat cooking spray. Pour 1 cup of the batter onto the waffle maker. Let cook for 2 1/2 minutes or until done. Top with fruit and yogurt, real maple syrup, honey, etc. as desired. 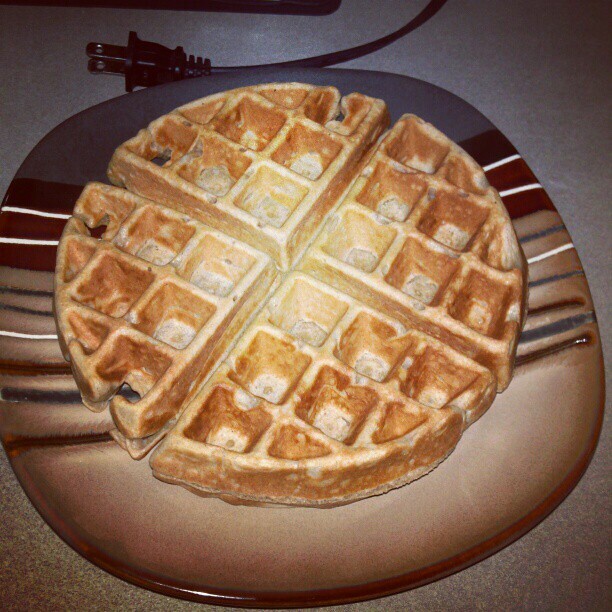 **These waffles freeze very well for easy, convenient breakfasts. After you cook them, let cool and freeze in air tight container or zip lock bag. To serve, place 1 waffle in the microwave for 45 seconds to 1 minute.